by Lifeboat Foundation Advisory Board member José Luis Cordeiro, MBA, Ph.D. Illustration courtesy of Éoin Colgan. Homo sapiens sapiens is the only species that has learned how to harness the power of fire. The conscious generation and use of external energy plays a unique role in our human and cultural evolution, from harnessing fire to developing nuclear fusion. Humanity has gone through several energy “waves”, advancing exponentially from wood, coal, oil, gas, and hydrogen/solar/nuclear in a continuous process of “decarbonization” and “hydrogenization” of our energy sources. The creation of an Energy Network or “Enernet” will allow us to connect the whole world and to increase, not reduce, our energy consumption. With the “Enernet”, energy and power will become abundant and basically free, just like information and bandwidth are today thanks to the Internet. This is fundamental for improving the living standards of all people around the world and for moving into the next planetary transition; energy is essential for solving humanity’s needs on Earth and for exploring and colonizing the universe. I then define the “Energularity” as the time when humanity becomes a Type I civilization according to the Kardashev scale, that is, a civilization that has basically achieved total mastering of the resources of its home planet. Based on our current power needs, humanity is at around 0.72 on the Kardashev scale, but it could reach Type I status in about a century. The Energy Singularity or “Energularity” is somehow similar to the concepts of the “Technological Singularity” (related to an intelligence explosion) and the “Methuselarity” (related to longevity extension). However, the “Energularity” emphasizes the exponential increase in energy consumption by our civilization on Earth, before we begin colonizing the Solar System and beyond. Many experts have advanced several theories about what makes humans different from other animal species. Humans have the largest brain-to-body mass and the largest encephalization quotient among all mammals. However, what caused it? Some scientists have written about the development of bipedalism and others about the development of language communication, both of which probably date from over 2 million years ago. Other scientists have considered the use of tools and the creation of technology as characteristically human. However, certain animals, including most primates, also exhibit signs of bipedalism, language communication, and even tool making, at least at a very basic level. But no other animals seem to use fire as humans do. Since fire was the first form of external energy generation (extrasomatic energy) adopted by humans, I believe that the way we use energy has also shaped our own evolution. After our early ancestors began to harness the power of fire, we have become increasingly different from all other species. There is evidence of cooked food using fire from almost 2 million years ago by our prehuman ancestors, although fire was probably not used in a controlled fashion until about 500,000 years ago by Homo erectus. The ability to control fire was a dramatic change in the habits of early prehumans that eventually became Homo sapiens sapiens about 100,000 years ago. Making fire to generate heat and light allowed people to cook food, increasing the variety and availability of nutrients. Fire also produced heat that helped people stay warm in cold weather, enabling them to live in cooler climates, and fire also helped to keep nocturnal predators at bay. The development of extrasomatic energy sources like fire has been fundamental to the growth of human civilization, and energy use seems to continue increasing almost exponentially into the future. Humans have used different forms of extrasomatic energy throughout the ages, starting with fire and including animal power, wind mills, hydropower and different types of biomass until the 18th century. The sources of such extrasomatic energy have changed according to time and place, and such changes have accelerated in the last two centuries. The evolution of energy sources in the United States of America (USA) is a good example of the changes in extrasomatic energy generation. Until the end of the 18th century, most energy production in the USA came from burning wood and other biomass. This began changing slowly with the growth of the coal industry during the 19th century. Another transition corresponded to the development of the oil industry in the 20th century, and still another “wave” could be identified with the relative growth of the gas industry in the early 21st century. Each one of these waves has been shorter since the different energy transitions have been happening faster and faster as shown in Figure 1. US futurist Richard Buckminster Fuller was one of the earliest proponents of renewable energy sources (mostly solar energy, including wind and wave energy ultimately produced by the Sun) which he incorporated into his design and work in the middle of the 20th century. He claimed that “there is no energy crisis, only a crisis of ignorance.” Decades ago, his research demonstrated that humanity could satisfy 100% of its energy needs while phasing out completely fossil fuels and nuclear fission energy, if required. Fuller also developed the concept of “energy slaves” in order to show how the human condition has been rapidly improving, partly thanks to the vast amounts of cheap energy available to more and more people. Thus, instead of human slaves, we actually had “energy slaves” that were just a concept to indicate how our advancing technology produced more goods and services for everybody without actually having human slaves working for just a few kings and queens (as it was in the past). In his World Energy Map, after his famous Dymaxion Map, Fuller estimated that every person had about 38 “energy slaves” in 1950. Thanks to continuous technological advances, Fuller extrapolated that the number of “energy slaves” would keep increasing, which was also very important to his idea of “accelerating acceleration.” Furthermore, Fuller believed that humanity urgently needed a global energy network and he first suggested the concept of an interconnected global grid linked to distributed renewable resources in his World Game simulation in the 1970s. Fuller concluded that this strategy was the highest priority of the World Game simulation and could positively transform humanity by increasing the global standard of living and connecting everybody around the planet. The creation of a global energy network has many advantages and has indeed been revisited in different ways by other experts, like US electrical engineer Robert Metcalfe, inventor of Ethernet and founder of 3Com. Metcalfe coined the term “Enernet” to describe such an energy network based on its similarities with the Internet. He has said that the Enernet “needs to have an architecture, probably needs some layers, standards, and storage. The Internet has lots of storage here and there; the current grid doesn’t have much storage at all.” In fact, just as with Internet, there should be major positive network effects with the Enernet. According to Metcalfe, the Enernet will bring fundamental changes in the way we produce and consume energy, from generation to transmission, storage and final utilization. The Enernet should really create a smart energy grid with distributed resources, efficient systems, high redundancy and high storage capacity. The Enernet should also help the transition to clean energy and renewable sources, with new players and entrepreneurs taking the place of traditional “big oil” and utilities, and old monolithic producers giving more control to energy prosumers (producers and consumers). Finally, we will continue the transition from expensive energy to cheap energy in a world where energy will be recognized as an abundant resource. Table 1 shows most of these major changes possible thanks to the Enernet. Now, decades later, are we using less bandwidth now than before? Of course not. We are using million times more bandwidth. If the Internet is any guide, when we are done solving energy, we are not going to use less energy but much, much more  a squanderable abundance, just like we have in computation. During all of human existence, people have worried about running out of natural resources: flint, game animals, what have you. Amazingly, all the evidence shows that exactly the opposite has been true. Raw materials  all of them  are becoming more available rather than more scarce. Telephone rates have decreased very rapidly, while there has been a continuous increase in the use of telecommunications. The rapid fall in telephone rates can also be compared with the long-term cost reductions in energy (together with the exponential growth of both information and energy usage). For example, US economist William Nordhaus calculated the price of light as measured in work hours per 1,000 lumen hours (the lumen is a measure of the flux of light) throughout human history. He compared estimates for fires in the caves of the Peking man using wood, lamps of the Neolithic men using animal or vegetable fat, and lamps of the Babylonians using sesame oil. After reviewing the labor-time costs of candles, oil lamps, kerosene lamps, town gas and electric lamps, Nordhaus concluded that there has been an exponential decrease of lighting costs, particularly during the last 100 years. However, some of these outstanding costs reductions, a ten thousand-fold decline in the real price of illumination, have not been captured by the standard price indices, as US economist James Bradford DeLong has emphasized. 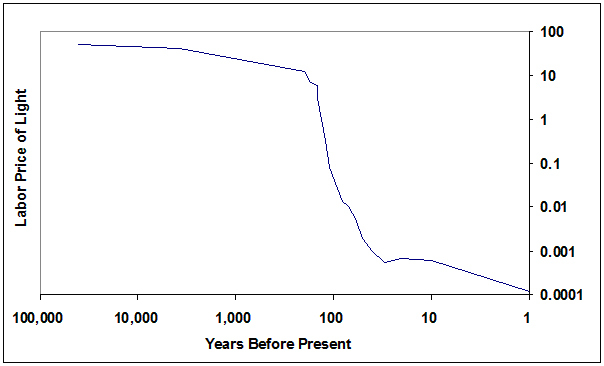 Figure 2 shows the staggering reduction of lighting costs through human history. The exponential decrease in energy cost has been even larger during the last century (while energy production has also increased exponentially). Another example of such accelerating changes can be seen in the semiconductor industry. The exponential increase of capabilities, and the corresponding reduction of costs, is commonly called Moore’s Law in semiconductor manufacturing. Caltech professor and VLSI (very large scale integrated circuit) pioneer Carver Mead named this eponymous law in 1970 after US scientist and businessman Gordon Moore (cofounder of Intel with fellow inventor Robert Noyce). According to Moore’s original observations in 1965, the number of transistors per computer chip was doubling every two years, even though this trend has recently accelerated to just about 18 months. Figure 3 shows Moore’s Law with an exponential scale in the vertical axis. A further increase in the rate of change can also be identified from the late 1990s. 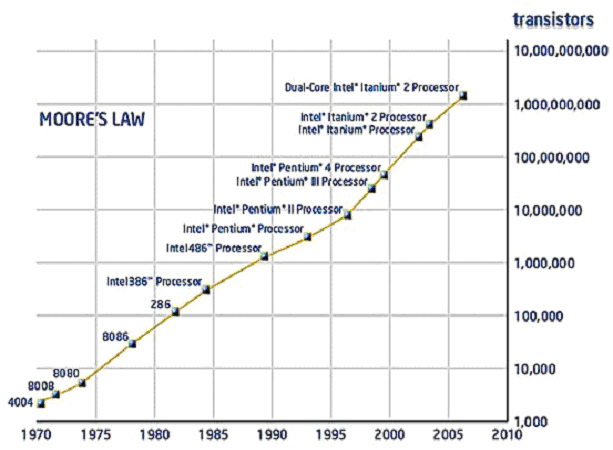 Moore’s Law and similar conjectures (since they are not really physical laws) have been observed for many processes, for example, the growing number of transistors per integrated circuit, the decreasing costs per transistor, the increasing density at minimum cost per transistor, the augmenting computing performance per unit cost, the reducing power consumption in newer semiconductors, the exponential growth of hard disk storage cost per unit of information, the accelerating expansion of RAM storage capacity, the rapidly improving network capacity and the exponential growth of pixels per dollar. In fact, in the specific case of USB flash memories, the Korean company Samsung follows Hwang’s Law, named after a vice president of Samsung, which states that the amount of memory in such devices doubles every 12 months. Concerning the eponymous Moore’s Law, Gordon Moore himself said that his “law” should still be valid for at least the next two decades or so, until transistors reach the size of single nanometers. Our children will enjoy in their homes electrical energy too cheap to meter… It is not too much to expect that our children will know of great periodic regional famines in the world only as matters of history, will travel effortlessly over the seas and under them and through the air with a minimum of danger and at great speeds, and will experience a lifespan far longer than ours, as disease yields and man comes to understand what causes him to age. Strauss was actually referring not to uranium fission reactors but to hydrogen fusion reactors that were being considered at the time, even if they were not constructed later on. His prediction was ahead of his time, but it is possible that it will finally turn into reality soon. Thus, energy and the Enernet will eventually become “too cheap to meter,” just as information and the Internet have basically become today. 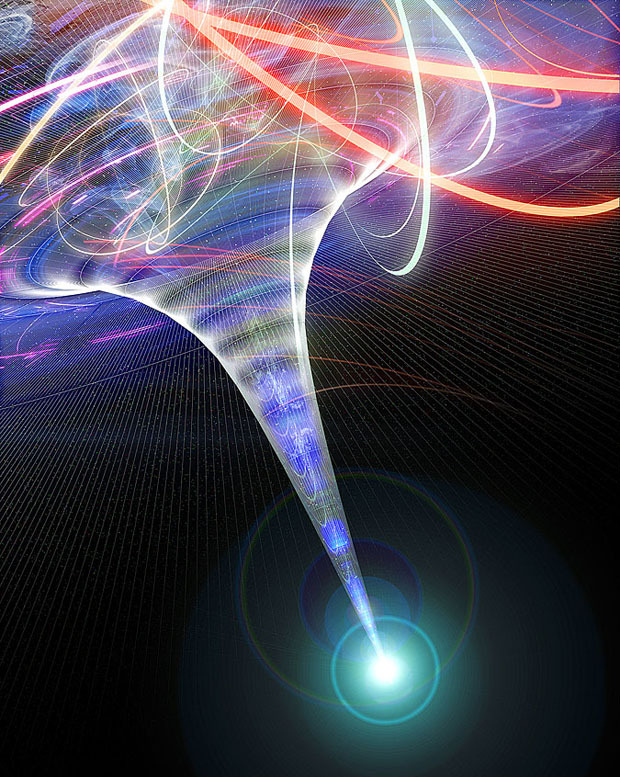 The idea of a “singularity” is known to science for many years. For example, there are mathematical singularities (like dividing by zero) and physical singularities (like a black hole). The concept of a “technological singularity” as an intelligence explosion was considered by English mathematician Irving John (I.J.) Good in the 1960s and then by US computer scientist and science fiction writer Vernor Vinge in the 1980s. Vinge further developed this idea in his 1993 article entitled “The Coming Technological Singularity: How to Survive in the Post-Human Era,” where he predicted that “within thirty years, we will have the technological means to create superhuman intelligence. Shortly after, the human era will be ended.” Thus, several authors now define such technological singularity as the moment when artificial intelligence overtakes human intelligence. In 2005, US inventor and futurist Ray Kurzweil published his best-seller The Singularity is Near: When Humans Transcend Biology, which brought the idea of the technological singularity to the popular media. According to Kurzweil, we are entering a new epoch that will witness the merger of technology and human intelligence through the emergence of a “technological singularity.” Kurzweil believes that an artificial intelligence will first pass the Turing Test by 2029, and then the technological singularity should happen by 2045, when non-biological intelligence will match the range and subtlety of all humans. It will then soar past it because of the continuing acceleration of information-based technologies, as well as the ability of machines to instantly share their knowledge. Eventually, intelligent nanorobots will be deeply integrated in our bodies, our brains, and our environment, solving human problems like pollution and poverty, providing vastly extended longevity, incorporating all of the senses in full-immersion virtual reality, and greatly enhancing human intelligence. The result will be an intimate merger between the technology-creating species and the technological evolutionary process that it spawned. An analysis of the history of technology shows that technological change is exponential, contrary to the common-sense ‘intuitive linear’ view. So we won’t experience 100 years of progress in the 21st century  it will be more like 20,000 years of progress (at today’s rate). The ‘returns,’ such as chip speed and cost-effectiveness, also increase exponentially. There’s even exponential growth in the rate of exponential growth. Within a few decades, machine intelligence will surpass human intelligence, leading to the Singularity  technological change so rapid and profound it represents a rupture in the fabric of human history. The implications include the merger of biological and non-biological intelligence, immortal software-based humans, and ultra-high levels of intelligence that expand outward in the universe at the speed of light. Based on similar ideas to the technological singularity and the Methuselarity, I have created the term “Energularity” in order to convey the notion of an exponential growth in our energy and power consumptions. For this, I use the Kardashev scale and I then define the “Energularity” as the time when humanity becomes a Type I civilization. Nikolai Semenovich Kardashev is a Russian astrophysicist who in 1964 proposed a scale to measure the level of technological progress in an advanced civilization. His scale is only theoretical and highly speculative in terms of an actual civilization; however, it puts the energy and power consumptions of an entire civilization in a cosmic perspective. The scale has three designated categories called Type I, Type II, and Type III. These are based on the amount of usable energy that a civilization has available at its disposal, and the degree of space colonization as well. In general terms, a Type I civilization has achieved mastery of the resources of its home planet, Type II of its solar system, and Type III of its galaxy. Table 2 shows the Kardashev scale within the context of different powers from the smallest to the highest values. In fact, the numbers correspond to power levels instead of energy levels, but remember that power is the amount of energy per unit of time: one Watt (or W, the standard SI unit of power) is defined as one Joule (or J, the standard SI unit of energy) per second. Therefore, as long as we are clear about the time span being considered, there should be no problem using power or energy values consistently. Conversely, the “Energularity” could also be considered as a “Powergularity”, but the first term is actually preferred and used here. Adopting Kardashev’s scheme in slightly altered form, I define a Type I civilization as one that has achieved full mastery of all of its planet’s resources. A Type II civilization is one that has mastered its solar system, while a Type III civilization would be one that has access to the full potential of its galaxy. The trek out of Africa was humanity’s key step in setting itself on the path toward achieving a mature Type I status that the human race now approaches. The challenge today is to move on to Type II. Indeed, the establishment of a true spacefaring civilization represents a change in human status as fully profound  both as formidable and as pregnant with promise  as humanity’s move from the Rift Valley to its current global society. Space today seems as inhospitable and as worthless as the wintry wastes of the north might have appeared to an average resident of East Africa 50,000 years ago. But yet, like the north, it is the frontier whose possibilities and challenges will allow and drive human society to make its next great positive transformation. Other authors have considered even higher types of civilizations than the three originally defined by Kardashev. For example, a Type IV civilization could have control of the energy output of a galactic supercluster (approximately 1042 W in our case) and a Type V civilization could control the energy of the entire universe. Such an advanced civilization would approach or surpass the limits of speculation based on our current scientific understanding, and it may not be possible. Finally, some science fiction authors have written about a Type VI civilization that could control the energy over multiple universes (a power level which could technically be infinite) and also about a Type VII civilization that could have the hypothetical status of a deity (able to create universes at will, using them as an energy source). Table 3 shows the different energy contents (specific energy measured in terms of Mega Joules per kilogram, MJ/kg) available in several different materials. Hydro power was one of the first extrasomatic energy sources used by humans, but its energy content is very low: only 0.001 MJ/kg for water stored at a height of 100 meters. Bagasse, animal dung, manure and wood fuels were relatively much better, ranging from 10 to 16 MJ/kg. Humanity then moved to coal, whose energy content goes from about 22 to 30 MJ/kg, depending on the type and quality of coal. Now hydrocarbon fuels are the main energy source, with 22 to 55 MJ/kg from methanol to methane, for example. Additionally, since the middle of the 20th century, several countries have also started using nuclear fission, and some fast breeder reactors produce 86,000,000 MJ/kg with Uranium. Humanity has continuously increased its energy sources throughout history, starting from different types of biomass and hydropower in the distant past, to coal and hydrocarbons constituting the largest energy sources today. Nonetheless, nuclear energy, first fission and later fusion, will probably become the major energy sources in the near future, while we keep moving towards the “Energularity” and finally become a Type I civilization. According to Kardashev, our civilization is still at Type 0 status, but we might reach Type I in the next century. Indeed, we have advanced exponentially in our energy uses from harnessing fire about half a million years ago to developing sustainable nuclear fusion in the coming decades. Eventually, we should be able to harness the full energy content of matter and convert matter directly into energy, according to Einstein’s equation, and even annihilate mater and antimatter to produce more energy. To have an idea of the incredible energy potential represented just by our planet, the Earth has an estimated mass of 5.98 x 1024 kg, which represents a theoretical energy content of 5.37 x 1041 J. Therefore, just our oceans have enough water to power humanity beyond Type I status over very long geological time scales. Additionally, in the case of our Sun, its mass is estimated to be 1.99 x 1030 kg, which is theoretically equivalent to 1.79 x 1047 J. Those numbers are really enormous and they represent more than enough energy for billions and billions of years. Considering the visible and known universe, its total mass-energy is currently estimated at about 4 x 1069 J. In a few words, there is certainly no lack of mass-energy in the universe. Moreover, ordinary matter is now considered to be only about 4% of the total matter-energy density in the observable universe, which also includes 22% dark matter and 74% dark energy as well. Since matter and energy can not be destroyed but only converted from one type to another, as scientists believe, there are almost unlimited amounts of energy for our civilization to keep expanding throughout the universe after reaching the “Energularity”. The Earth is the cradle of humanity, but one cannot stay in the cradle forever. British Telecom. 2005. Technology Timeline. London, UK: British Telecom. Chaisson, Eric. 2005. Epic of Evolution: Seven Ages of the Cosmos. New York, NY: Columbia University Press. Clarke, Arthur Charles. 1984 (revised). Profiles of the Future: An Inquiry into the Limits of the Possible. New York, NY: Henry Holt and Company. Cordeiro, José Luis. 2010. The Future of Energy and the Energy of the Future. San Francisco, CA: Singularity Institute for Artificial Intelligence. Cordeiro, José Luis. 2006. Energy 2020: A Vision of the Future in Creating Global Strategies for Humanity’s Future. Bethesda, MD: World Future Society. de Grey, Aubrey D.N.J. 2008. The Singularity and the Methuselarity: Similarities and Differences. Lorton, VA: Methuselah Foundation. DeLong, James Bradford. 2000. Cornucopia: The Pace of Economic Growth in the Twentieth Century. NBER Working Paper 7602. Cambridge, MA: NBER. Foundation for the Future. 2007. Energy Challenges: The Next Thousand Years. Bellevue, WA: Foundation for the Future. Foundation for the Future. 2002. The Next Thousand Years. Bellevue, WA: Foundation for the Future. Fuller, Richard Buckminster. 1981. Critical Path. New York, NY: W.W. Norton & Company. Glenn, Jerome and Gordon, Theodore. 2010. State of the Future 2010. Washington, DC: The Millennium Project. Good, Irving John. 1965. Speculations Concerning the First Ultraintelligent Machine in Advances in Computers, Vol. 6. Burlington, MA: Academic Press. Hawking, Stephen. 2002. The Theory of Everything: The Origin and Fate of the Universe. New York, NY: New Millennium Press. Kahn, Herman et al. 1976. The Next 200 Years: A Scenario for America and the World. New York, NY: William Morrow and Company. Kaku, Michio. 2005. Parallel Worlds: The Science of Alternative Universes and Our Future in the Cosmos. New York, NY: Doubleday. Kardashev, Nikolai Semenovich. 1964. Transmission of Information by Extraterrestrial Civilizations. Soviet Astronomy 8:217. Kurian, George T. and Molitor, Graham T.T. 1996. Encyclopedia of the Future. New York, NY: Macmillan. Kurzweil, Ray. 2005. The Singularity is Near: When Humans Transcend Biology. New York, NY: Viking. Kurzweil, Ray. 1999. The Age of Spiritual Machines. New York, NY: Penguin Books. Metcalfe, Robert. 2007. The Enernet. Unpublished presentation. Nordhaus, William. 1997. Do Real Output and Real Wage Measures Capture Reality? The History of Lighting Suggests Not in The Economics of New Goods. Chicago, IL: University of Chicago. Sagan, Carl. 1977. The Dragons of Eden: Speculations on the Evolution of Human Intelligence. New York, NY: Random House. Sagan, Carl. 1973. The Cosmic Connection. New York, NY: Doubleday. Simon, Julian Lincoln. 1996. The Ultimate Resource 2. Princeton, NJ: Princeton University Press. Vinge, Vernor. 1993. The Coming Technological Singularity. Whole Earth Review. Winter issue. Wells, Herbert George. 1902. The Discovery of the Future. Nature, 65. Zubrin, Robert. 1999. 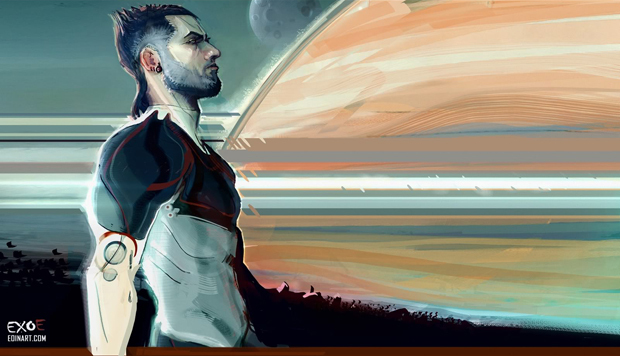 Entering Space: Creating a Spacefaring Civilization. New York, NY: Jeremy P. Tarcher/Putnam.